Zero waste is getting a lot of traction these days. Cities across the world are committing to zero waste goals. Lifestyle blogs are popping up at such a rate we will never need another recipe for homemade toothpaste. The questions you may be asking yourself though are what does zero waste mean and why should we care? Zero waste is a philosophy that promotes reuse, recycling, and protection of resources, but also, and more importantly, it emphasizes sustainability by considering the entire life-cycle of products, processes and systems. The main goal is not only to recycle more, but rather to reduce consumption and ensure that materials are made to be reused, repaired and re-imagined again and again. Zero waste provides multiple benefits to the community. First, it benefits the environment by reducing greenhouse gas (GHG) emissions, improving air and water quality, and protecting habitat and open space. By diverting waste from landfills, we reduce two of their main byproducts: landfill gas and leachate. Landfill gas is comprised mostly of carbon dioxide and methane, the latter being a potent GHG that results from the breakdown of organic waste (which includes food waste). According to the Alachua County Department of Solid Waste, 18% of the material we send to the landfill are organics. Leachate is produced when rainwater percolates through a landfill; when water comes in contact with waste, it is contaminated with pollutants (e.g. organic compounds, heavy metals, ammonium, bacteria, and so on). Modern landfills are much better at containing leachate than older ones, but even the best liners will deteriorate over time. It only takes a small amount of leachate to contaminate large volumes of groundwater. Finally, when one landfill reaches capacity, another one must be created or expanded. Adopting zero waste practices and goals prevents Florida’s habitat and open space from being lost to yet another disposal area for trash. Second, zero waste benefits the health and well-being of community residents by reducing pollution and minimizing the use of toxic materials in the products we use. We all know that clean air and water are essential to a healthy population. By diverting waste from landfills, we reduce the amount of gas and leachate that can have a negative impact on public health. One issue that has garnered a lot of attention is the amount of plastic waste in the ocean and its effect on marine life and humans. A recent study highlighted by the New York Times looks into the impacts caused by plastic material breaking down into tiny particles as they are exposed to saltwater, sun and surf. Those particles become coated with toxic substances, such as PCBs and other pollutants. The research suggests when fish eat those particles, they may reabsorb toxins. This can pose a health threat to the animals and humans that eat the contaminated fish. Many organizations are focusing their efforts on removing plastics from the ocean, but it comes with a price. The collection systems have to be fine enough to capture tiny pieces of plastic, but as a result they also capture a lot of marine life. That’s why it is critically important, especially in Florida, to improve waste management onshore by eliminating the use of plastic where we can and recycle the rest. Let this be a challenge to the innovative residents of Gainesville to embrace no waste, and start businesses that ensure food does not end up in the landfill (inspiration: Copia) or create entirely new products using recyclables (check out Bionic Yarn). This gets you up to speed on the basics of zero waste and some of its benefits, but we've only scratched the surface. Stay tuned for the next blog entry: Straws of Steel. *Environmental Protection Agency. "Sources of Greenhouse Gas Emissions: Commercial and Residential Sector Emissions". *Alachua County Department of Solid Waste and Resource Recovery. 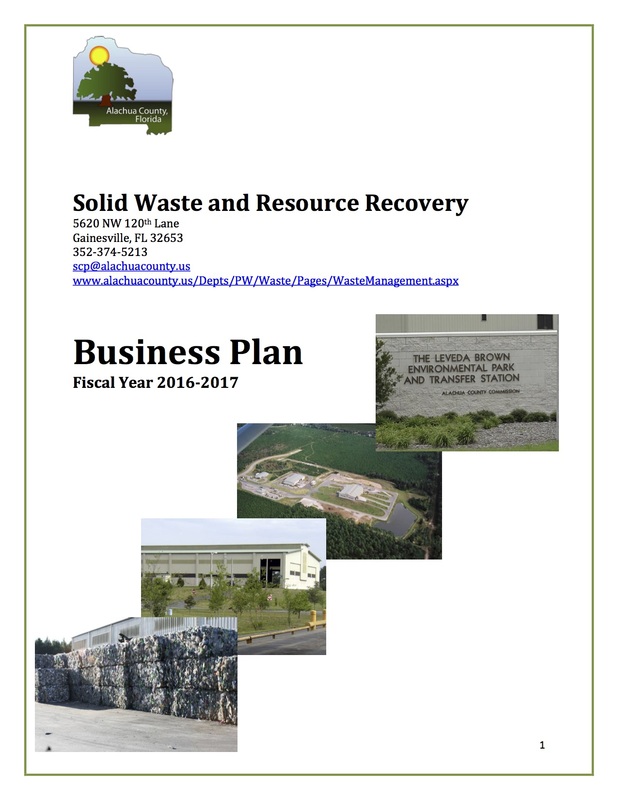 "Solid Waste and Resource Recovery Business Plan 2016-2017". *Mukherjee, Sumona & Mukhopadhyay, Soumyadeep & Hashim, Mohd & Gupta B., Sen & = Faculty of Engineering University of Malaya, Address. "Contemporary Environmental Issues of Landfill Leachate: Assessment and Remedies". Critical Reviews in Environmental Science and Technology. vol. 45, 2015, pp. 472-590. *Schwartz, John. "Study Finds Rising Levels of Plastics in Oceans", John Schwartz, New York Times, 2015. *Environmental Protection Agency. "Recycling Economic Information (REI) Report".